This is the first post of a new category that starts today. I will dub this category ‘today in 90s NBA’ and as it becomes apparent from its name it will consist of posts about things that happened at the same day in one of the 1990s NBA seasons. Today is the 3rd of June 2015 and I will be looking 25 years back at what happened in the NBA in 03/06/1990. I am sure that anybody that loves the NBA at 90s knows and remembers that the Bulls, in order to become the Bulls of the 90s, had to overcome the obstacle of the Detroit Pistons. In the same sense, the Pistons in order to get to the NBA Finals had to defeat the Bulls and this is how one of the great rivalries of the NBA was born. I suppose that the rivalry between the two franchises originates in the fact that they are both located in Midwestern US and thus there is a geographical rivalry among them. 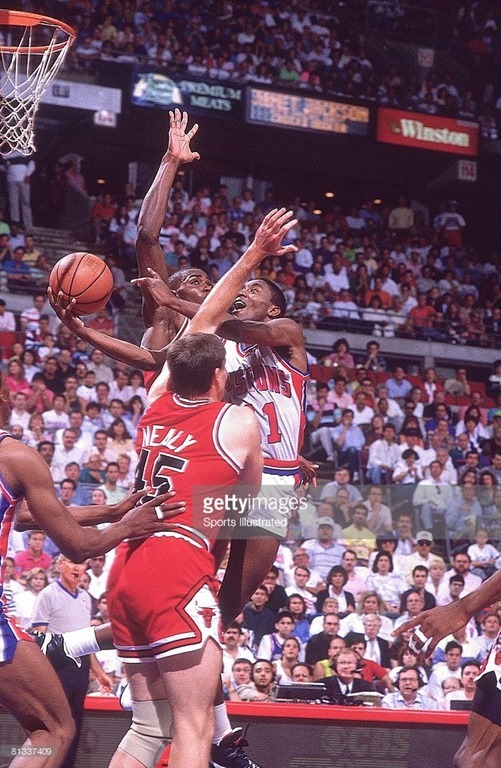 However, the rivalry between these two teams in particular, the late 80s-early 90s Pistons and Bulls, began in 1988; when they first played each other at the ECSF. In 1988, Pistons were too much for the Bulls and beat them in 5 games (4-1), to finally lose to the Lakers in the NBA Finals . Next season, the Pistons did it again; this time though was a bit harder as the Bulls were able to win two – in fact the Bulls were up 2-1 after three games in the series. In 1990, the Bulls looked stronger and they entered the play-offs as the 3rd seed in the East with only 4 wins less than their rivals Pistons that finished first with 59 wins. So, both teams, after defeating easily their opponents in the first and second round of the play-offs, were able to reach the ECF, as it was expected and anticipated by every NBA fan around the world. Following a series of six very physical games, both teams defended their home courts successfully and the series was tied at 3-3 with the seventh and final game scheduled for the 3rd of June, 1990. The question was whether the Bulls were ready to make the break or the Pistons would be able to defend their home court one more time to win the series. The answer came from the Pistons and it came in an emphatic way with a big win against their rivals at the Palace of Auburn Hills in front of almost 22.000 of their fans; 93-74 was the final score and the Pistons were once again the champions of the Eastern Conference. As Sam Smith wrote the next day in the Chicago Tribune: ‘the Pistons, it turned out, let the Bulls only close enough to dream.’ Isiah Thomas, the leader of the ‘Bad Boys’ that had a great game with 21p., 11a., 8r and 2s., said that it was just another play-off game, to irritate the Bulls’ fans even more. Meanwhile, Chuck Daly, the coach of the Pistons, emphasized on the inexperience of the Bulls and Thomas’ great performance. Michael Jordan, on the other hand, devastated by another play-off elimination and a super effort against the ‘Jordan Rules’ defence employed by the Pistons admitted that Detroit was a better team on paper as well as on the court. MJ had a near triple-double performance with 31p., 9a., and 8r., but did not get any help from his teammates, especially on offence. The key, however, to Pistons decisive victory over the Bulls was Scottie Pippen’s performance, who had migraine issues and scored 2p. hitting only 1 out of 10 from the field. Pippen, who according to the Bulls physician John Hefferon had suffered from migraines earlier in the season due to adrenaline surge, said that he was feeling well at that morning but the migraines came back during the warm up.